It’s incredibly frustrating, isn’t it? You’ve invested time and energy into building this new habit. You’ve kept it up for weeks now, maybe even months. Slowly but surely, changes are beginning to happen in your life, and you start to wonder just how good things could get if you kept this up all year. What if you kept it up for five years? Or ten? Life gets in the way. You skip a gym session, you eat a piece of chocolate, you forget to journal in the morning or do your Spanish homework. Either way, one slip turns into two, which turns into three, and suddenly…you’re back where you started. Which reveals an uncomfortable truth, the kind of truth that most people don’t like to admit. Habit change is hard, really hard. And most people are simply not going to keep up with our new habits for longer than a couple of months. To be honest, that used to be the case with me all the time. I’d be great at starting new habits, but three months in I would let the ball slip. And this happened over, and over, and over again. Fortunately, over the years I’ve learned a few tricks that allowed me to keep these new habits until they became unconscious and stuck. While I still slip up from time to time, I’m far more effective than I used to be. In fact, by keeping the following principles in mind, in 2016 I was able to both journal and meditate for 180 days straight. So without further ado, here are 3 critical steps to make sure that your habits stick for years! 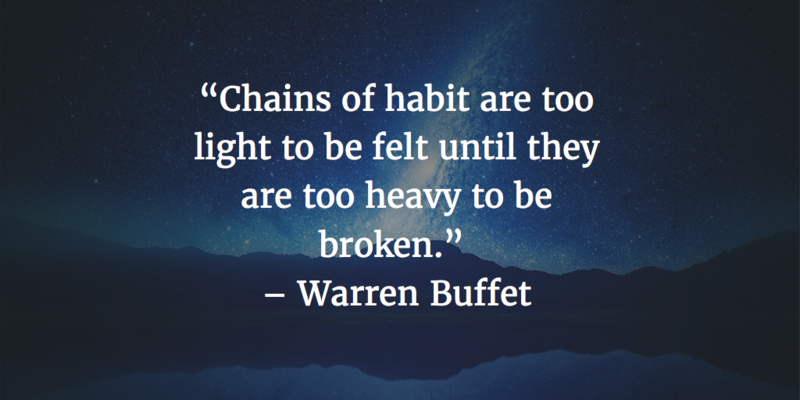 When you are setting goals based on your new habits there are two things to keep in mind. Make your short-term goals realistic. These need to be broken down into bite-sized chunks that are manageable every day. For example, don’t start off by attempting to meditate for an hour a day, you’ll just burn out – start with ten minutes and add 30 seconds a day till you reach an hour. Make your long-term goals unrealistic. If your long-term goals aren’t big enough, they’re not going to motivate you. And even if you don’t get there, you’ll make huge improvements you can be proud of anyway. You can’t rely on your memory to keep your habits going! Let me say that again, so you remember it. If you have a reminder that is inconsistent or that is only available to you at certain times, it’s not going to be good enough. Use a digital calendar or ‘triggers’ to keep yourself on track every day. Even if you’ve already started to implement a new behavior, it’s important to know why the habit hasn’t stuck in the past in the first place. If you don’t address the root cause, the issue can be lying in the background just waiting for you to be tired or hungry or jet lagged, and then it’ll pounce. Go through a process of self-inquiry to get to the bottom of your behaviors. Why don’t I exercise in the morning? Because I didn’t sleep enough the night before. Why didn’t you sleep enough the night before? Because I stayed up late and had a couple of glasses of wine. Why did you stay up late and drink wine? Because I’m stressed from work and feel like I need to unwind. For example, in this situation, you originally thought that you had an issue with motivation to exercise, but really your issue was with stress at work. This is where keystone habits come into place, as something like meditation may reduce workplace stress, which leads to more morning exercise! As I said before, habit change is hard. However, small consistent changes almost always lead to huge results in the long run. Make sure that you keep these three tips in mind next time you try to adopt a new habit. Attention Pick the Brain Readers! Are you ready to ignite change in your own life? Ben is a freelance writer, and the creator of Project Monkey Mind—a blog that delves deep into psychology, spirituality and the mind, and offers practical wisdom for the digital age.